This post is the fourth in a five-part series (I. Projection, II. Base Maps, III. Color Selection, IV. Symbology, and V. Legends) which will look at various GIS tools and methodologies utilized by Stratasan. In this post we will discuss different types and styles of symbologies used in our maps at Stratasan. Symbology is the combination of the color, shape, and size of attributes on a map. It is critically important in polygon, line, and point layers. Symbology is quintessential in making a map readable and in helping the information on the map be interpreted both easily and quickly. The symbology of attribute labels helps the map reader understand what locations are important and which locations are most significant. Without proper symbology, a great map can become completely useless. Polygon features have multiple working parts in their symbologies. The first part is color (discussed in the Color blog post), but color by itself is not enough. Transparency of the feature enables the map reader to see through the polygon layer to other features below it. The location of polygon attributes within the layers of the map is another important part of polygon symbologies.. Polygon features should be placed closer to the base map so that line and point attribute layers (such as roads, boundaries, patients, and facilities) can be placed on top of them and easily seen/interpreted by the map reader. Line layers are a crucial part of any map, especially when you think of how many different kinds of lines need to be displayed. Differentiating these lines in clean and logical ways can be difficult, but it is not impossible. At Stratasan we use a variety of techniques to help keep the line features unique. These include: line color, thickness, and multi-line features. Line color is important in every layer, especially the line color within road and boundary layers. The thickness of lines indicate a feature's importance (The thicker the line, the more important it is). Multi-line features (for example the County layer in the map above) help differentiate the line types (The county lines have a dashed line through them to help distinguish them from the road layers). Line features can also have certain levels of transparency, like polygon features, if the map reader needs to see what is underneath them. When talking about the symbology of point layers there is a lot of echoing of the color post; make sure that colors can be easily differentiated and are not too bright or busy. Using symbols other than just circular points is important as well. 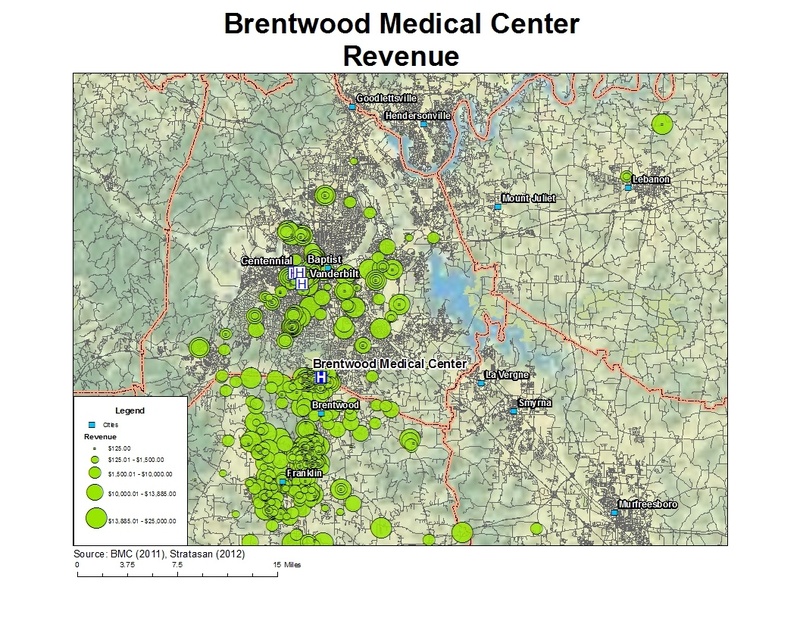 At Stratasan, we like to use squares (like the cities layer in the map below), triangles, icons (like the hospitals in the map above), or small pictures as point icons in out maps. By using these different types of point symbols we allow the map reader to look at many different points at once without cluttering the map and making it difficult to read. Graduated symbols are point layers representing values of a point based on the size of the symbol around it. They are created around the points they represent. When using graduated symbols, there needs to be large enough range of sizes or it will not be easy to distinguish the different values the layer is representing. If you look back at the previous maps you will notice each uses a variety of labels. These labels are important in showing the map reader where points of interest are located. The color, size, and shading around each point indicate the level of importance of the labeled polygon/point/line. 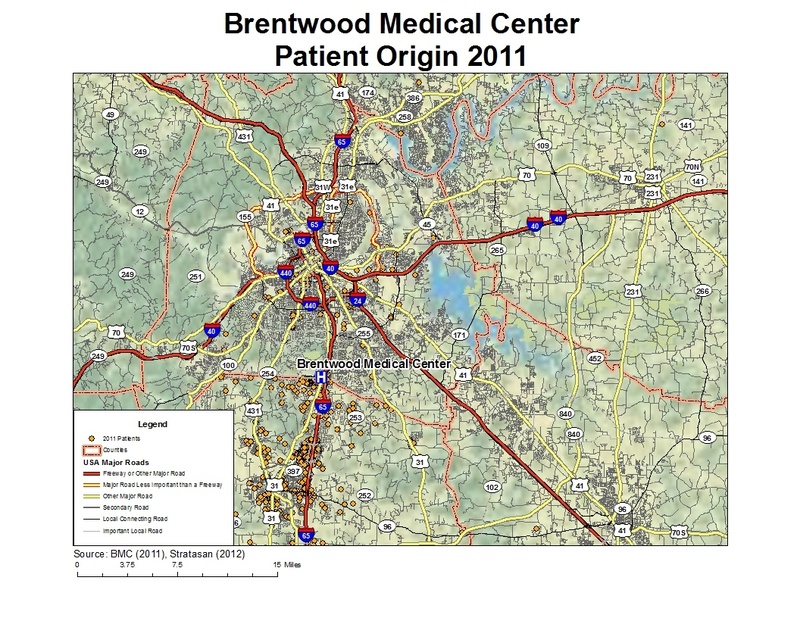 For example, the Brentwood Medical Center labeling throughout the maps shows that it is the most important point of interest. It has the largest font and is the only label that has black text with a white halo (which is the area of color around the text). Other, less important, but still relevant points of interest have a smaller white text with a black halo. 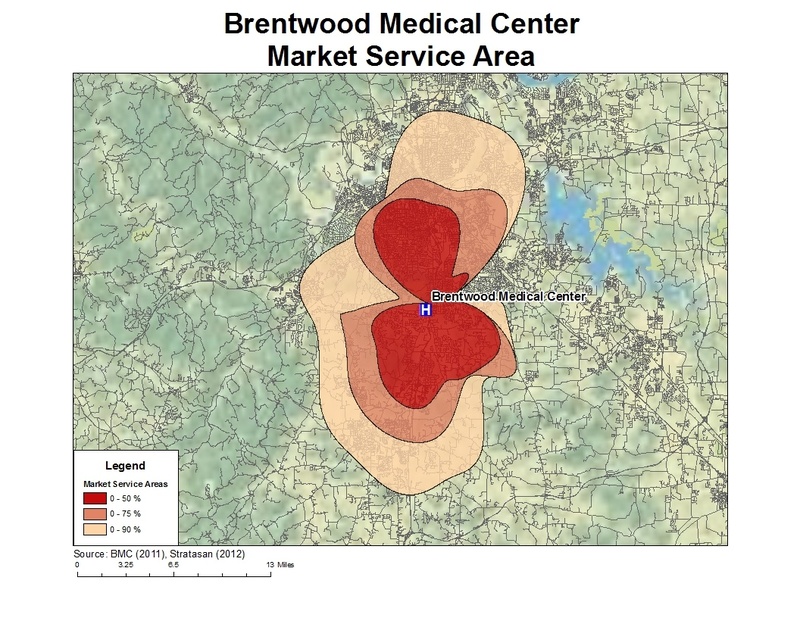 This indicates that they are still worth looking at to the map reader, but their size and color tells them that they are of less relevance to the main point on the map, in this case Brentwood Medical Center. Symbology is important on EVERY map. Without it, a map is virtually unreadable. 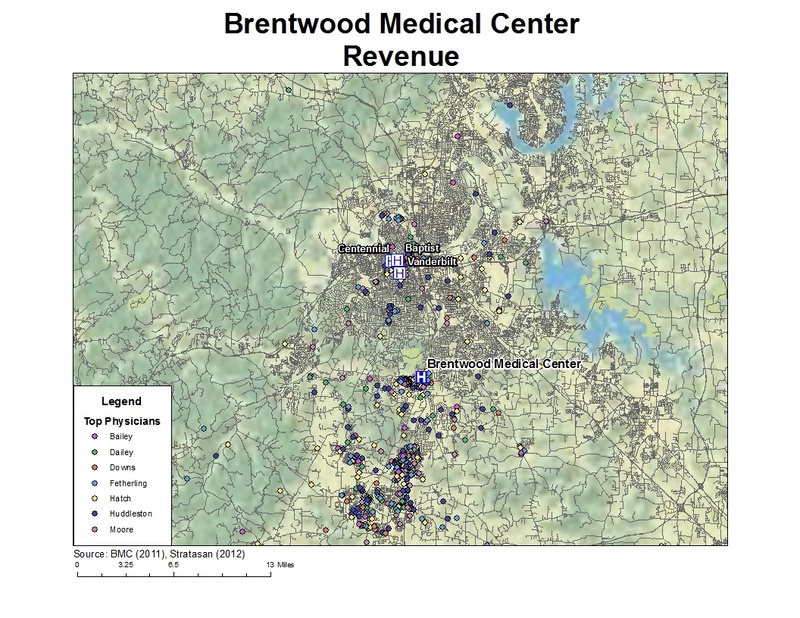 At Stratasan, symbology is a vital component in the maps we make for our customers. A great symbology makes a map. Without an effective and atheistically pleasing symbology a map becomes confusing and unreadable. At Stratasan we always use the best symbology schemes possible for the customers we are serving. You can learn more at our website.